Scientists have determined that the weave of the flax linen cloth dates back to Jerusalem at the time of Jesus. Furthermore, pollen and dust found on the Shroud are native to where, according to the Bible, Jesus lived and walked. Unlike his blood, the man’s crucified image does not penetrate the cloth but rests on top. His image could be scraped away with a razor blade. Since any earthly substance used to create the man’s image would seep into and adhere to the cloth, this lack of penetration continues to baffle modern science. As one would expect, blood of that crucified male penetrates the linen cloth. 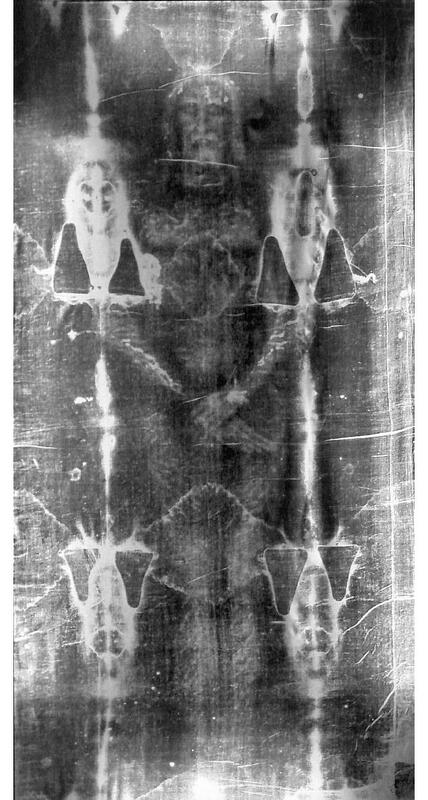 But here is where science enhances the Shroud’s mystery: Blood on the cloth preceded the image of the crucified man. “Blood first, image second” is a mantra of Shroud researchers. [T]ests on the mysterious substance constituting the image have concluded that it was applied with 100 percent consistency, as it rests on the cloth’s top two microfibers. Such consistency is a feat impossible to achieve with human hands. In plain view are over 100 whip marks on every portion of his body, left by scourging from Roman flagra. Blood stains that formed a circle around the top of his head are consistent with the crown of thorns. Local Jerusalem road dust has been discovered on the cloth over his knees, severely bruised after several falls. Most notable are the holes left by large spikes, the marks of crucifixion, displayed on his wrists and feet. Blood stains can be seen near a large wound that would have been consistent with injury from a spear in his side. But what about the carbon-14 tests that dated the cloth much later than the time of Christ? The results of that testing, according to which the Shroud was created during the period between 1260 and 1390, reflected tests only to tiny pieces of border additions known to have been used to repair the cloth after it was damaged by a fire in the 16th century. National Review: What Does the Shroud of Turin Prove about Easter?